If you’re anything like me, you have a lot more fly lines than you do reels and spare spools. Consequently, I’m always switching lines around. I’ve tried just about every cheap fix to help aid me in winding and unwinding spools; from using my fingers (slow, awkward), to a power drill and duct tape (better in theory than in reality). Thus, I am thrilled–just thrilled–to see Rio Products‘s elegant, cheap new solution. The Cranky is a $10 plastic crank that fits Rio’s (and only Rio’s!) line spools. It uses the square hole in the center of said spools as a gripping point, and it has a small handle that sticks out the other side so you have something to turn against. 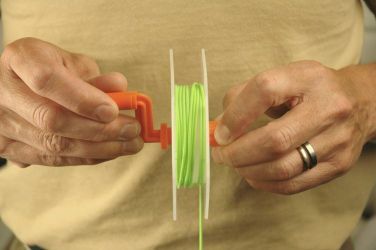 From now on, instead of pulling off line in carefully-stacked piles (and punting the cat if he gets too close), I’ll be able to simply drop a reel in a hat (or bowl, or laundry hamper), run the line through a tensioner (a book works nicely), and crank it right back onto the spool. Rio was fast enough to get out a review model for me and I can say that it absolutely works like a charm. The only thing I would change would be to extend the stationary “grip handle” on the opposite side of the crank so I could really hold on tight; at its present length, it works just fine but you have to sort of grip with the ends of your fingers. 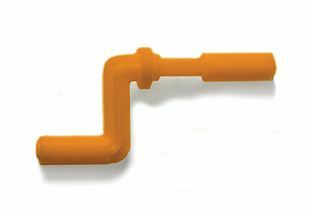 I was told by Rio’s reps that they agree, but that increasing the size of the handle would have driven up the cost of the product due to the molds used. Keeping a low price is the most important thing with this kind of product: overall, I am thoroughly impressed. Look for the Cranky in flyshops in the next few weeks. Have you ever been forced to cut the Gordian knot when trying to swap out fly line spools? Let us know in the Comments section!